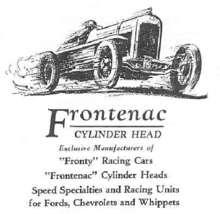 Frontenac Motor Corporation was the joint venture of brothers Louis, Gaston, and Arthur Chevrolet. Named for Louis de Buade de Frontenac, the company's main business was preparing racing parts for Model Ts. 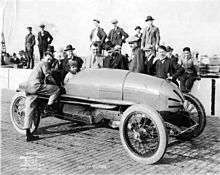 Frontenac race car before the 1921 Indianapolis 500. Driver Tommy Milton at the wheel, with Barney Oldfield and Louis Chevrolet (with hat).